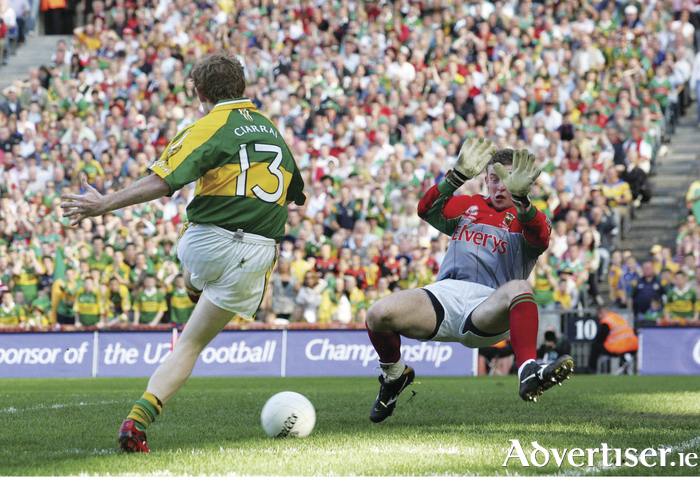 The very publicised retirement and eulogising of Colm Cooper caused much debate among friends and foes, current and past players, print and TV media over the last number of weeks. Joe Brolly fought an unwinnable battle against Ciaran Whelan and Tomas O'Shea on league Sunday declaring Cooper went missing in big games when Kerry needed him most and had to keep referencing Cooper's performances against Tyrone as an example of this. My old house mate and Sigerson cup team mate, Padraic Joyce, wrote quite an interesting piece for AIB GAA which pretty much can be summed up into the fact that no forward in Ireland played well against that Tyrone team in their heyday. A point I wholeheartedly agree with. That Tyrone team were capable of bringing the finest to their knees including Cooper. We can all agree that Cooper was a special talent and player, memories of him terrorising us in Croke Park forever implanted. His game changed significantly over the years. For his latter years, he wasn't a prolific scorer but more a play maker. The last time I saw him in the flesh was against Corofin in Limerick in the All-Ireland club semi final in February. He conducted the orchestra in the second half that day with some sublime passing and expert keep ball awareness. Another dimension added to his game in the latter years was he became a protector to Kerry’s and especially Dr Croke's emerging talent. In his early days he was probably seen as an easy target to exert some physicality on, not so now however, he'll take no nonsense of anyone. Daithi Burke a two time hurling All-Star and Corofin midfielder, went in aggressively on one of Cooper's young team mates late in that club semi-final and the Gooch wasn't long getting hold of Burke to let him know he wasn't standing for it. For me the clip of Cooper on the big screens in Croker before the league final (which even had the Dubs applauding ) was a little over the top; I don't recall that happening for any other player before (correct me if I'm wrong ). Cooper was a good one that’s for sure and definitely one of the best in my living memory and the send-off he has been given and the publicity that followed can mean only one thing, there is no chance of a u-turn and he will never terrorise Mayo again. Thankfully. Either Dublin or Galway will be crowned this year's, and the last ever, All-Ireland u21 football champions after contrasting wins over Donegal and Kerry respectively in their semi finals. It's a shame this competition will be no more, especially after the contest served up by Galway and Kerry. Both Kerry and Donegal were hot favourites to make the final but Galway and Dublin obviously never read the script. Donegal did have to play two games in a week, which is being touted as an excuse for their poor showing against Dublin, but that should not affect the performance of players at that young age. I fancied them to win the u21 this year on the back of five of their players playing so effectively against Mayo in the final league game in Castlebar. They were extremely disappointing and kicked some horrible wides in the u21 semi final. You could sense from very early on it was not going to be their day. It took until the 30th minute for them to register their first score from play. The strength of Dublin football was reiterated in the fact that the only u21 player we really knew of was Con O'Callaghan who was black carded early on and the Dubs didn't even miss him. I have no doubt four or five of their u21 players would be regular starters on the majority of county senior football teams. Galway were very impressive in their win over un-backable favourites for the title Kerry, racing into a nine point lead after 10 minutes. Their forward play was sublime but the way they harassed the Kerry backs to turn over the ball impressed me the most. Their shooting did become a little erratic for a while which allowed Kerry back into the game, but it would have been a travesty had they not made the final. Peter Cooke and Cein D'Arcy dominated midfield for the Tribesmen but the player that impressed me the most was flying wing back Cillian McDaid who will surely be in Kevin Walsh's plans come championship time. Cooke surprisingly has been let go off Kevin Walsh's senior panel while it's expected that his midfield partner Darcy will be called up when the u21 finishes. It will be interesting to see who gets their hands on the cup that rested on Stephen Coen's mantelpiece for the last 12 months.